Opposition political parties and civilians in the Northern Province are looking at initiating legal action against the military’s acquisition of lands that were demarcated as a high security zone (HSZ) during the period of the war. TNA MP, M. A. Sumanthiran said the party was collecting information and statements to file a case against a proposed military cantonment in the Palaly area. An official notice has stated that about 6,400 acres around the Palaly airport in the North and East of Valikaman were being acquired for a military cantonment. Sumanthiran said this would affect 35,000 people and 9,900 households. Of these, preliminary enquiries had suggested that at least 5,000 people would file a case. So far over 500 petitioners’ names had already been collected, Sumanthiran said. “If the land is to be used as a military cantonment, that means the Army would be settling their families in the village, seriously affecting the demography there,” he alleged. There were similar issues elsewhere, with 9,000 extra voters from Weli Oya being annexed to the Mullaitivu area, all of them Sinhalese families, Sumanthiran alleged. About 1,000 Sinhalese had been settled in pockets in the Vavuniya area as well, he said. This was also happening in the Eastern province, where land was being cleared to settle more people, Sumanthiran said. The TNA noted that Section 2 notices under the Land Acquisition Act were pasted on trees in Valikamam North in Jaffna and this area would be acquired for military cantonments. Sumanthiran explained that owners of these lands live just outside the so-called illegal HSZ, in camps maintained by the government. They have lived there for over 25 years. And although their title to these lands were checked and cleared by a Committee appointed by the Supreme Court in 2006, they were not permitted to go and resettle on the assertion that demining was incomplete. In 2006, the Supreme Court of Sri Lanka decreed that displaced people should be resettled. 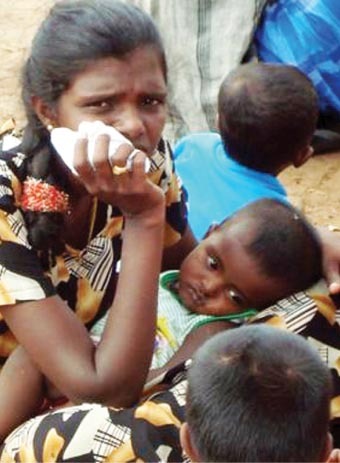 According to Sumanthiran, President Mahinda Rajapaksa has undertaken resettling all these war displaced by the end of 2009, in his joint communiqué with the UN Secretary General Ban Ki Moon on May 26, 2009. The TNA has emphasised the fact that land grabs have taken place in various places in the North including Jaffna, Mullaitivu, Mannar, Vavuniya and Kilinochchi. The party has also noted that one of the recommendations of the Lessons Learnt and Reconciliation Commission (LLRC) that was appointed by President Mahinda Rajapaksa in 2010 was to release the private land being used for ‘security purposes’ at the time. Another recommendation was that the government disengage security Forces from all civil administrative activities as rapidly as possible. Meanwhile, during a recent visit of the Opposition and UNP Leader Ranil Wickremesinghe along with several party members to the North, civilians and business community in the area who had lost their lands due to the HSZ and the government’s move to acquire lands, had requested the main opposition party to also intervene and help them get back their lands. Wickremesinghe had agreed to raise the issue in parliament. According to UNP parliamentarian, Ravi Karunanayake who also accompanied Wickremesinghe in the trip to the North said that the party was also looking at filing independent court cases. He explained that the UNP would look at filing separate cases before court to help the civilians get back their lands. He added that the UNP would look at the acquisition of civilian lands by the authorities in the North and Eastern Provinces. However, the UNP delegation was prevented from entering the HSZ. “Following the civilians’ representations, we tried to visit the HSZ area. The Jaffna Army Base permitted us to visit the area, but it was over ruled by the Ministry of Defence and we were not allowed to enter,” Karunanayake said. “Even parliamentarians are not allowed to visit the areas that have been liberated for four years in the North,” he added. He said that the move has affected the ties between Sinhala and Tamils. “We will not take over Sinhala land. Likewise others should not take this land. This is illegal. The name of the place has been changed to Janakapuram and other Sinhala names,” Sivalogeswaran noted. He explained that after being resettled, they have received relief for about six months. “But now we have no relief and no job. We are living in difficulty. How can we raise a family?” he questioned. “As fishermen there are problems too with the Indians coming and poaching, but our boats are at home because we have no equipment for them. We filed a case in Supreme Court against this. The case has been postponed to June. The case is not against any community, but just to stop our land being encroached,” Sivalogeswaran added. He urged the government to show compassion. “The country would become like Somalia if the current situation continued,” he said. “We have no issues with the army. We have a good relationship with them. They are doing a lot. But they should not take our land. That is happening in some places. We will welcome it if proper lands are given to all families without taking lands owned by Tamils,” Sivalogeswaran said, adding that the committee has handed a petition to the President through government officials in the area. “Deeds for this land have been given to the Sinhala families illegally. In Kokilai, the land originally belonged to Tamils. Muslims are also here and involved in illegal fishing,” the resident added.